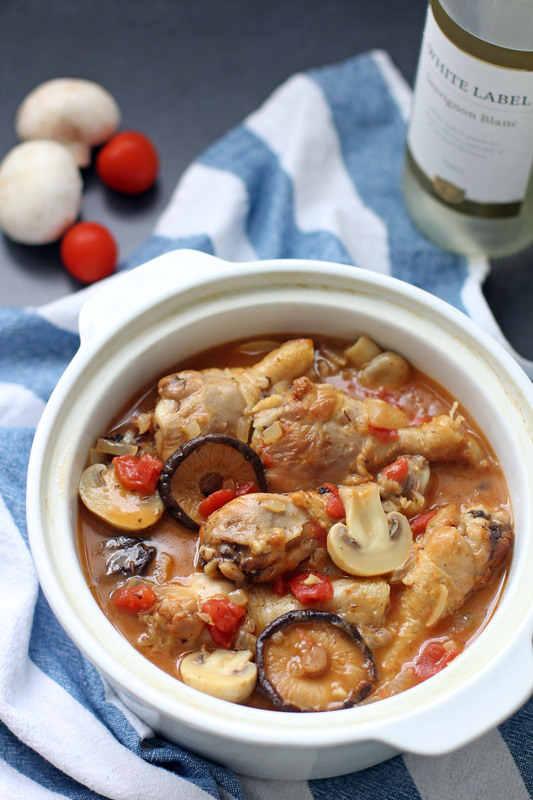 Chicken Chasseur is a classic French casserole dish where chicken, mushrooms and shallots are cooked in a Chasseur sauce. Chasseur sauce on the other hand is a type of demi-glace sauce which contains fresh mushrooms, shallots, tomatoes, white wine and butter. This sauce was said to be created during the 1600s by Duke Philippe De Mornay the same person responsible for four more popular sauces: Mornay, Béchamel, Lyonnaise, and Porto. Chasseur is a French word that means “hunter” and the dish is named liked such because this was a popular dish with bird hunters during those days. Wild game birds shot badly or tough meat birds were the primary meat choice where it was boiled for a very long time and cooked together with vegetables they had gathered in the way back home after their hunting spree. Since then the recipe was mostly untouched apart from the meat hence it retains is rustic characteristic. A very tasty dish especially when you use the free range chickens, you can enjoy this with bread, rice or pasta. In a heavy pot add 2 tbsp butter and brown chicken pieces. Remove then set aside. Using the same pot do the same thing with mushrooms then set aside. Add the remaining butter in the same pot then sauté garlic and onions. Add tomatoes and continue to stir for 1 minute. Add chicken stock, white wine, paprika and mustard bring to a boil then add the chicken and mushrooms. Simmer in low heat for 1 hour or more until chicken is tender. Add water if necessary. Season with freshly ground black pepper and salt. You can use normal chicken but it will be less tasty. Duck can also be a good alternative. I’m not familiar with the Chasseur flavor, but it looks Very Tasty. I think my family would enjoy this. Thanks! I soon will have several free range chickens in my freezer. This will be perfect. It sounds delicious Raymund! Love your repertoire of classic recipes Raymund. I’m sure this dish takes you right back to France! My folks & sister are travelling there in August. Yum ! Another classic French dish that I love !